During the last PDC Microsoft announced a next innovation: Async C#, currently available as CTP. There is also a respective white paper; I recommend reading it, if you need an introduction. 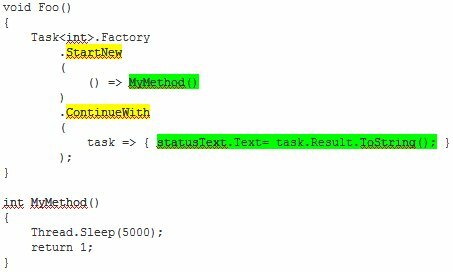 As you can see, the compiler mainly translates an await into a new task and the remainder of the method into a continuation for that task. To tell the truth, the actual generated code looks quite different; this is semantically equal, though. If we are talking about a UI thread, the runtime ensures that the continuation runs on the UI thread as well. The task version would need to marshal the call to the UI thread explicitly, e.g. by calling Dispatcher.BeginInvoke. If the wait is contained within a loop of some kind, the compiler also handles that, cutting the loop into asynchronous bits and pieces. 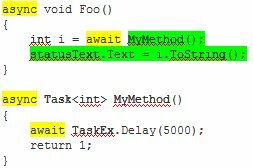 Similarly for conditional calls. That’s a nice set of features and there is no doubt that this approach works (there is a CTP after all). And reception within the community so far has been very positive. Note: Examples have a tendency to oversimplify. I chose this set to overcome that effect: Soma provides a simple introduction, Netflix is more “real world”, and Eric looks at it form a language designer point of view. Three different samples, three different people, three different perspectives. Note 2: The code I present is from my test solution (download link at the end), thus it is not exactly a citation, rather it’s complemented with my bookkeeping code. I also didn’t address every question that may arise (such as exception handling) explicitly. This post got long enough as it is. He provides a „conventional“ asynchronous solution, that looks… quite convoluted, actually. Note that I prepended the necessary code to synchronize the call. Easier to write, and easier to understand, no question about that. However: Looking at the awfully convoluted task based version, I asked myself: „Who would write such code in the first place?“. The use case is to load some web pages and sum up their size. And to do this asynchronously, probably to avoid freezing the main thread. And the solution – awful and async/await alike – insists on getting the value for one web page asynchronously, but coming back to the UI thread to update the sum. Then starting the next fetch asynchronously, and again come back to the UI thread to update the sum. This is very close to the await/async version, nearly equally easy to write, and certainly as easy to understand. And it did not need a language addition, merely a little thinking about what it is that shall actually be accomplished. OK, one example that didn’t really convince me. The Netflix sample is part of the CTP and was also used by Anders Hejlsberg during his PDC talk. The sample solution comes with synchronous version, conventional asynchronous version, and new async/await version. Twice as much code (85 LOC), a mixture of event handler registrations with nested lambdas and invokes. It takes considerable time to fully understand it. No one in his right mind would want to have to write this. Again the initial verdict: The async/await version looks nice and clean compared to the ugly task based version, and very similar to the synchronous one. Hail to async/await. Let’s take a step back and look at the use case: Call a web service asynchronously to avoid freezing the UI (as the synchronous version does), update the UI with the result, and call the web service again if there is more information available. The task based version tries to manually dismantle this loop into a sequence of asynchronous call followed by callback on the main thread to update the UI, followed again by the next asynchronous call. Add cancelation and exception handling and it is surprising that it isn’t even more ugly than it already is. I left the QueryMovies Method out for brevity, as it is similar to the synchronous version above. Again this is very close to the await/async version, again nearly equally easy to write, and – again – certainly as easy to understand. And – again (pardon the repetition) – it did not need a language addition. Merely – ag… ok, ok – a little thinking about what it is that shall actually be accomplished. Another example that didn’t convince me. But two is still coincidence. Eric has a slightly different use case: For a list of web addresses, fetch the web page and archive it. There should be only one fetch at a time, and only one archive operation, but fetch and archive may overlap (described here). This is more about overlapping different operations, rather than avoid freezing the UI, as in the previous examples. Not quite as simple as the async/await version, but if you look closely, it’s actually a very close translation into continuations. And… equally inefficient. You may have noticed the comments I put in there, stating that there is some unnecessary synchronization between a fetch and an earlier archive operation. “‘f” stands for fetch, “a” for archive. The lower part shows the operations according to their start and end time. You can depict nicely how tasks follow other tasks, and how fetch and archive run in parallel. No fetch overlaps another, no archive overlaps another archive operation. Well. Have a look at line 3. See how the fetch starts after the archive in line 1 was finished? It could have started earlier, couldn’t it? Same in line 6. That’s the unnecessary synchronization I mentioned above. However, now I becomes a little more complex and hard to understand. Fetch and archive start independently of each other, making the solution more effective than the async/await version. Why? Because I actually thought about the problem and the solution, rather than simply throwing asynchronicity on the code. If anything, this example raises even more concerns than the other ones. Three different samples. Three times presenting some conventional task based asynchronous code – code that is rather convoluted, ugly, and hard to understand. Three times a nice async/await version that clearly makes the code nicer. But also three times it “only” took a little thinking to come up with a far nicer task based version than the proposed convolution. Two times very close to the async/await version. The third time actually more efficient than that. One could actually get the impression that the convoluted task based code has been deliberately made ugly in order to provide a better motivation for the new features. I wouldn’t go that far, but still, it raises some questions, as to how these examples came into being. Perhaps a back-port of what the compiler produces for async/await? Granted, each example I examined may have its own compromises which slightly invalidates it (as is often the case with examples); had I only found one, I wouldn’t have bothered writing this post. But: One is an incident, two is coincidence, three is a trend. And I did not stumble over one example yielding a different result. I showed that the value of async/await is less compelling than presented. This does raise the question, whether it is still compelling enough to merit a language extension. The way I verified my concerns was actually to take one step back and think about the demand. I hate to think that async/await actually encourages developers to think less and in turn write less than optimal code – especially the less experienced developers who’ll have a hard time understanding the implications of those keywords in the first place. To make that clear: I did not show anything that suggests that the async/await language feature is per se wrong. Nor did I prove that there is no use case that does not suffer from my concerns (only that Microsoft failed to present them yet – or I failed to find them). Make more obvious what the code actually does (e.g. see the comments here for some naming suggestions – although my concern goes beyond simple naming issues). Rethink the task based samples you are basing your reasoning on. We don’t need a feature that makes convoluted code simpler; we need features that make code simple, we would write in the first place. BTW: Whether async/await is backed into the language or not, this endeavor showed one thing quite clearly: Asynchronicity is important, and becoming even more so. And Microsoft certainly did accomplish something great with the TPL, on which all these discussions built without even mentioning it anymore. And as Reed pointed out, Tasks play a major role in the CTP as well. Finally: Here is the download link for those who’d like to recheck my findings.